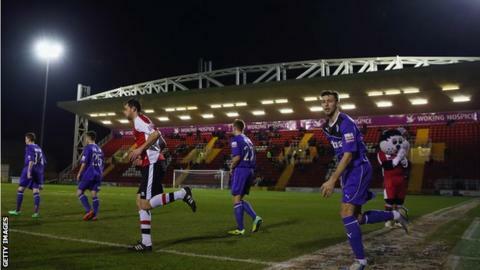 Woking could be taken over by a local consortium headed by Ashley Read, whose company is a sponsor of the Cards. The 34-year-old says he was approached this summer and asked if he was interested in buying the 75% stake of majority shareholder Peter Jordan. Read has submitted a "statement of intent" to buy the club, which the Woking board will discuss on Thursday. "I won't make an actual offer until due diligence is completed," Read told BBC Surrey. "Since I was approached, my treatment by the board has been unprofessional. I met them three weeks ago and offered to sign a non-disclosure agreement, but haven't received anything yet. "The club had debts of £437,000 in the last financial year, and I want to run it properly. "I want to manage the club's finances, sustain the club and push it forward. But there won't be lots of money pumped in. It needs management, not investment." Woking chairman Mike Smith refused to comment on Read's interest, saying the board of directors would discuss the matter in private.